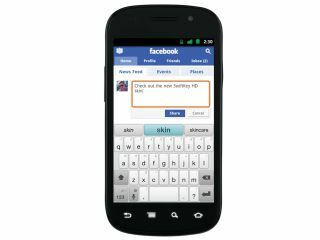 The second generation of Swiftkey, a popular text-input app for Android, is set to be launched at Mobile World Congress 2011, and will use your Facebook, Twitter and Gmail accounts to learn how you type. The app offers a different kind of text prediction to T9, the traditional predictive text, learning your writing style and suggesting phrases that you're likely to use in context. It has proven very popular with Android users, garnering over 650,000 downloads over the past six months. The new function will see Swiftkey become, er, swifter at learning your style, as well as studying how you make errors based on the way you type. An app that scours your social networking profiles to learn how you think is a slightly scary concept but, on the plus side, it should make texting quicker. The first licensing deal TouchType has struck will also be announced at Mobile World Congress 2011, seeing the software come bundled with a series of Android devices in much the same way as the Samsung Galaxy S comes with Swype pre-installed. The company is now working on a tablet edition of Swiftkey, which should be released some time in Q2. "Android makes it very easy to port the software across because it's so open, but because usage inputs are quite different on tablet screens, we're doing more than simply porting the mobile keyboard over," said Reynolds.